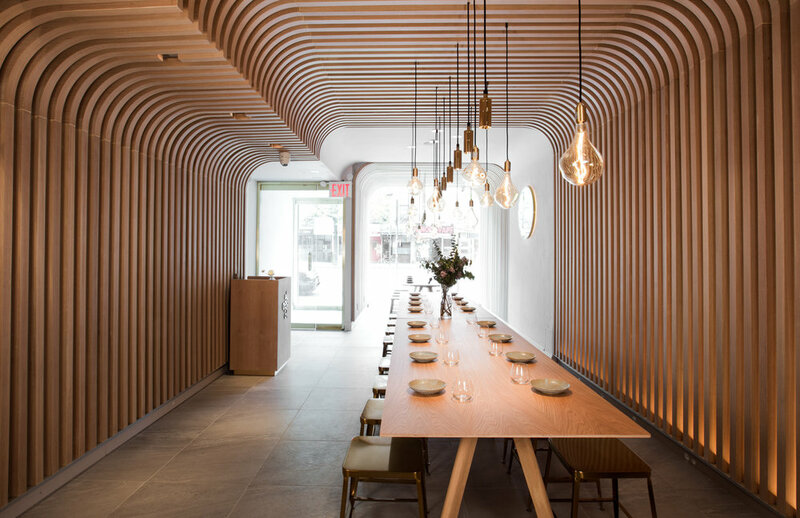 A contemporary Chinese eatery serving Hunan rice noodles and plates. Each dish is designed by artist/chef Chao Wang, who seeks to cure his homesickness through cooking. The dishes are restructured yet the flavors are deeply rooted in the everyday meal of Hunan people. Grew up in the epicurean city Hengyang of Hunan, Chao Wang has an understanding of food that is deeply rooted in the slurping sound-filled little alleys and what his grandmother has cooked. After 25 years of living as an oil painting artist, Wang set down his brushes and opened Hunan Slurp. To him, food is an extension of his art rather than a new venture. At Hunan Slurp, Wang aims to present Chinese grassroots’ everyday meal in artistic forms, while keep the flavors true to the region’s humblest dishes. While the word “slurp” sounds applicable to all soup noodles, it is translated directly from the Hunan dialect “suō” when they refer to the action of eating rice noodles. Hunan rice noodle has a distinguished, well-rounded flavor. The noodles are not veiled by heavy flavors, and instead complements the freshness of each ingredient. The most signature rice noodle would be the Fish Fillet Mifen. Wang slow simmers pork bone overnight and adds in wok-fried fish, boil until the soup turns milky white. Then he lets customers plunge mifen into the soup with seasonal greens on the side. Contrary to what one might assume, Hunan Slurp is not just a noodle shop. The plates also play a lead role on the menu. Try the Hunan Charcuterie, the Stir-Fried Young Chicken, or the Hunan Salad, and you will understand what "a simply yet profoundly a taste of home" means. Other signature dishes such as Frog, Smoked Pork, and Skewed Beef perfectly inherited the Hunan's essence: layers of different chili peppers. You would first smell the spice in the air; and as you dig into the dish, the heat slowly builds up yet the dish becomes more irresistible.